Volunteer Zambia works across the capital city of Zambia, Lusaka. 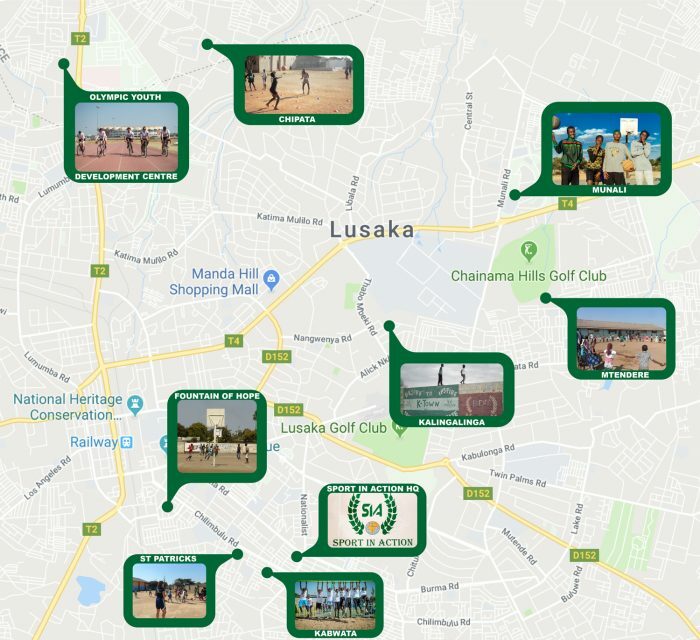 Within Lusaka, our staff and volunteers coordinate with schools, volunteer organisations, governmental organisations and the Sport in Action Office. Located in the heart of a shanty town, this rural school is rich with culture and sporting enthusiasm. As most volunteers say, you haven’t been to Zambia, until you have been to Chipata. Located off the main road In Lusaka, this private school contains brand new netball, volleyball and basketball courts! Located close to the Sport in Action Office, Fountain of hope makes up from lack of numbers with huge character and charisma from all of its students! Recently developed and funded by the perfect day foundation, children hear are often orphans or homeless, fountain of hope gives them a safe place to live, laugh and learn. Located in the heart of the suburbs, K-town is home to 3 schools that offer a wide variety of courses and sports facilities. The huge outdoor space is home to a number of football teams and tournaments. Located around the corner from Sport in Action, this brand new facility was built using donations from The Perfect Day Foundation in 2017. Pioneered by PDF ambassador, Mel Marshall, this facility features a full-size basketball court, a beach football pitch and a childrens play-park. Located outside of the city centre, this peaceful school features a multitude of volleyball and football pitches. Located 3 hours north of Lusaka, this rural placement is home to an isolated Sport in Action office and 2 local schools. A number of students are chosen to work out here every year on a number of different projects around the more isolated community.